We have three styles of Window Packs Gift Boxes which make up our Twin Glass gift packs options. Each of these styles are suited to fit the differing sizes of our promotional wine, spirit and beer glasses and mugs. 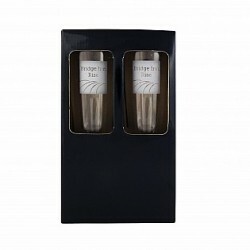 The three styles of Window Pack Gift Boxes include: Flute/Tall Beer glass gift box, Hi-Ball Tumbler/Small Wine glass gift box and a large wine glass gift box. The window in the boxes allows you to show off your branding as it is visible from the moment your client or customer opens the packaging. Our Twin Glass Gift Packs are a great presentation choice when you are sending wine, beer or spirit glasses to colleagues or clients. The gift boxes will help keep your promotional product safe in transit and these gift packs can be easily printed with your logo or branding of choice, which will allow you to present a cohesive promotional campaign.